Protozoans are a group of eukaryotic single-celled organisms. Several species of protozoans infect humans and inhabit the body as commensals or parasites . The parasitic protozoans of major medical importance include certain species of amoebae, flagellates, and sporozoans. The most notorious amoeba of humans is Entamoeba histolytica, an inhabitant of the large intestine. Although often harmless, it can become invasive, penetrating into the mucous membrane of the intestine, multiplying and eroding the tissue. The result is a disease called amebiasis, characterized by intense abdominal pain, blood and mucus in the stool, diarrhea, and dehydration (a syndrome called amebic dysentery). Amebiasis can be fatal, especially to infants and children. In addition to the intestinal infection, the amoebae sometimes get into the bloodstream and establish secondary sites of infection in the liver, brain, or elsewhere. 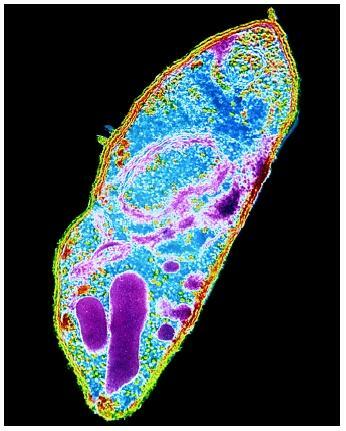 Entamoeba histolytica is acquired from food or water contaminated with sewage. Several other amoebae, such as Entamoeba coli, inhabit the human intestine with little or no harm to the host, but their presence indicates that the person has ingested food or water contaminated with human feces and may be at risk of more serious infections. The world's most common cause of water-borne diarrhea is the flagellate Giardia lamblia. Outbreaks of giardiasis are common in schools, mental hospitals, prisons, and other crowded institutions, but occur in circumstances as diverse as luxury resorts, backcountry camping, and impoverished villages. Giardia attaches to the surface of the small intestine, often in numbers great enough to seriously interfere with nutrient absorption. Unabsorbed nutrients then pass to the large intestine and cause gas production, painful abdominal cramps, and diarrhea. In Africa, tsetse flies transmit another parasitic flagellate, Trypanosoma , which causes African sleeping sickness. Victims become fatigued, emaciated, and eventually lapse into a coma and die. Even though it does not occur in the United States, trypanosomiasis is one of the world's leading public health problems. Malaria is another leading cause of death in tropical countries. It is caused by four species of the protozoan genus Plasmodium . Transmitted by mosquitoes, Plasmodium multiplies in the liver and then invades the red blood cells, destroying them so extensively as to cause severe anemia . The victim experiences alternating fever and chills as the parasites emerge together from infected red cells, invade new ones, multiply, and repeat the cycle until finally the victim is overcome by exhaustion. An electron micrograph of Plasmodium falciparum, one of the parasites that causes malaria. is infected, it can cause serious fetal deformities resulting in infant blindness, hydrocephalus, and physical and mental retardation. Any parasitology textbook can provide further details on these and related parasitic protozoans, how they infect humans, mechanisms of disease, and how to control or avoid them. Schmidt, Gerald D., and Larry S. Roberts. Foundations of Parasitology. 6th ed. Dubuque, IA: McGraw-Hill Higher Education, 2000.